Marketers are likely already familiar with the Pareto Principle: roughly 20% of consumers of a product account for 80% of sales. Some may think these high-volume consumers are already doing enough to help the brands they frequently purchase, but in Superconsumers Eddie Yoon illustrates how highly-engaged consumers in a category can be effective drivers of sales growth and valuable consumer insights. The basic premise of Superconsumers is that there exists a type of "superconsumer" that not only buy certain products in massive quantities but also have a deep passion for the category and a certain brand specifically. While a small subset of the overall consumer base for most brands (about 10% according to Yoon), superconsumers can account for up to 70% of sales. They are intensely loyal to the brands, use them in many different contexts, and have the potential to purchase even more of the brand in the future. 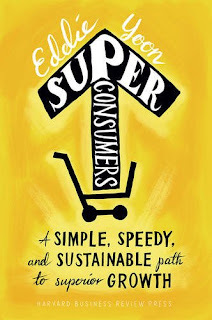 Superconsumers begins with several case studies highlighting how companies leveraged superconsumers to solve their business problems and then concludes with chapters on how readers can apply these principles to their own companies. Brands reached out to these consumers for insights to help understand why they are such ardent fans of their products and would often apply these learnings to attempt to move consumers at the precipice of superconsumer-ism status to surpass that threshold. The cases showcase a decent amount of variety, from CPG to dolls, though they are short and a bit shallow when it comes to analysis. A few definitely could have benefited from a little extra material, especially a compelling case about a private label grocery brand trying to compete with major brands and position themselves as a premium product. Yoon then goes into some more practical chapters about how marketers can go about taking advantage of superconsumers at their own companies. Yoon is a principal at The Cambridge Group, a brand consulting firm that recently became a subsidiary of Nielsen. While this partnership with the market research company allows Yoon to pull from a plethora of proprietary consumer data for his book, sometimes Superconsumers reads like an advertisement of Nielsen's services and gets a bit sales-y. That said, the book still has an interesting premise, and while I'm not totally convinced that a superconsumer-based strategy can succeed outside of CPG (the CPG cases and examples Yoon draws upon are way stronger than his other material) the concepts make for nice food-for-thought for marketers working in the category.